WT Birkalla will be hosting the Sturt Lion FC to compete for the Ross Family Cup this Sunday, in a full day of football action! Games kick-off from 9am with our Under 16’s up first at Adelaide Shores Football Centre, followed by our Under 18s and Reserves. 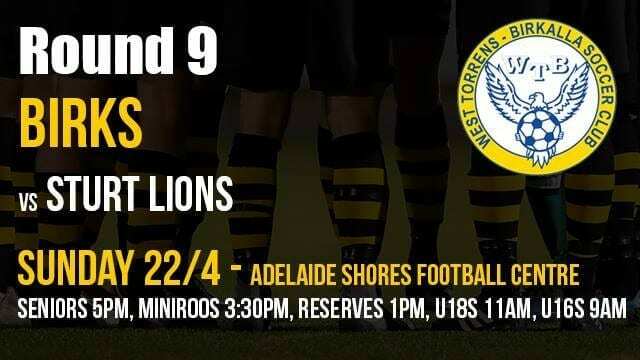 At 3:30 pm, our Under 10 MiniRoos will take to the pitch for their matches ahead of the Senior team at 5 pm who will compete against Sturt Lions for the Ross Family Cup. Presentations will be held at 7 pm after the game where Andrew Ross will present the Ross Family Cup Trophy to the winning team. Join us for what is sure to be a great Club day! ◂ We will fight on!